The Student Sessions Activity Report provides detailed information about each student's session activity and milestones reached in EdReady. Click on the Student Data Tab. Click the Activity Report link in the Actions column for a particular student. Click the Details link in the Actions column for a particular student. Please note: You must have the appropriate permissions to access student session reports. Additionally, if you do not have account permissions to manage students, you will not be able to access student sessions from the Edit EdReady Version screen. If you need access to student session information but do not have it, please contact the EdReady administrator for your institution. To view a detailed record of a student's activity for a particular session, click the Details link in the Actions column. The Sessions Report includes a time stamp for each time the student entered a goal, visited a study path, viewed a resource or started a testing activity. Click the Change View link to switch to a table view of the session activity details. This feature is still in development. 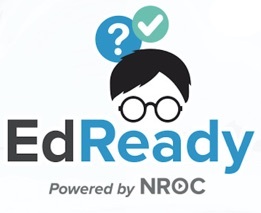 EdReady tracks and records various student milestones as they progress along their study path. Currently, a milestone will appear on this tab when a student completes an initial diagnostic and/or when they reach their target score. More milestones and more detailed information will be available when the functionality is completely implemented.